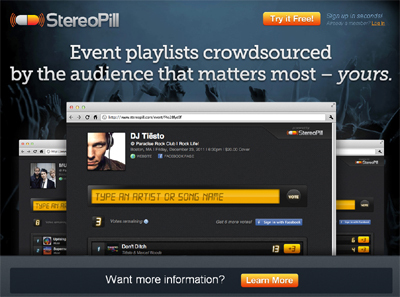 StereoPill is a web application that offers wedding planners and event organizers the ability to crowd source their guest’s music taste before the big day. The application was created to empower guests to vote on what songs they want to hear, prior to the wedding or other large party. With the crowd-sourced data, StereoPill supplies DJ’s, event planners, or anyone with valuable insight into what individuals want pertaining to music selections. StereoPill is different because it’s the only application of its kind. Individuals have an understanding of what’s popular based on music boards and online content but they have no direct way of knowing what they’re guest want. By adding the ability of social interaction people can ensure a successful event hours before arrival.